Strict separation of powers does not operate in The United Kingdom, the political structure of which served in most instances as a model for the government created by the U.S. Constitution. Under the UK Westminster system, based on parliamentary sovereignty and responsible government, Parliament (consisting of the Sovereign (King-in-Parliament), House of Lords and House of Commons) was the supreme lawmaking authority. The executive branch acted in the name of the King ("His Majesty's Government"), as did the judiciary. The King's Ministers were in most cases members of one of the two Houses of Parliament, and the Government needed to sustain the support of a majority in the House of Commons. One minister, the Lord Chancellor, was at the same time the sole judge in the Court of Chancery and the presiding officer in the House of Lords. Therefore, it may be seen that the three branches of British government often violated the strict principle of separation of powers, even though there were many occasions when the different branches of the government disagreed with each other. Congress has the sole power to legislate for the United States. Under the nondelegation doctrine, Congress may not delegate its lawmaking responsibilities to any other agency. In this vein, the Supreme Court held in the 1998 case Clinton v. City of New York that Congress could not delegate a "line-item veto" to the President, by powers vested in the government by the Constitution. Where Congress does not make great and sweeping delegations of its authority, the Supreme Court has been less stringent. One of the earliest cases involving the exact limits of non-delegation was Wayman v. Southard 23 U.S. (10 Wheat.) 1, 42 (1825). Congress had delegated to the courts the power to prescribe judicial procedure; it was contended that Congress had thereby unconstitutionally clothed the judiciary with legislative powers. While Chief Justice John Marshall conceded that the determination of rules of procedure was a legislative function, he distinguished between "important" subjects and mere details. Marshall wrote that "a general provision may be made, and power given to those who are to act under such general provisions, to fill up the details." Marshall's words and future court decisions gave Congress much latitude in delegating powers. It was not until the 1930s that the Supreme Court held a delegation of authority unconstitutional. In a case involving the creation of the National Recovery Administration called A.L.A. Schechter Poultry Corp. v. United States, 295 U.S. 495 (1935), Congress could not authorize the president to formulate codes of "fair competition." It was held that Congress must set some standards governing the actions of executive officers. The Court, however, has deemed that phrases such as "just and reasonable," "public interest" and "public convenience" suffice. Executive power is vested, with exceptions and qualifications, in the President. By law (Section 2.) the president becomes the Commander in Chief of the Army and Navy, Militia of several states when called into service, has power to make treaties and appointments to office "with the Advice and Consent of the Senate," receive Ambassadors and Public Ministers, and "take care that the laws be faithfully executed" (Section 3.) By using these words, the Constitution does not require the president to personally enforce the law; rather, officers subordinate to the president may perform such duties. The Constitution empowers the president to ensure the faithful execution of the laws made by Congress and approved by the President. Congress may itself terminate such appointments, by impeachment, and restrict the president. Bodies such as the War Claims Commission, the Interstate Commerce Commission and the Federal Trade Commission—all quasi-judicial—often have direct Congressional oversight. Congress often writes legislation to restrain executive officials to the performance of their duties, as laid out by the laws Congress passes. In INS v. Chadha (1983), the Supreme Court decided (a) The prescription for legislative action in Art. I, § 1—requiring all legislative powers to be vested in a Congress consisting of a Senate and a House of Representatives—and § 7—requiring every bill passed by the House and Senate, before becoming law, to be presented to the president, and, if he disapproves, to be repassed by two-thirds of the Senate and House—represents the Framers' decision that the legislative power of the Federal Government be exercised in accord with a single, finely wrought and exhaustively considered procedure. This procedure is an integral part of the constitutional design for the separation of powers. Further rulings clarified the case; even both Houses acting together cannot override Executive vetos without a 2⁄3 majority. Legislation may always prescribe regulations governing executive officers. The Executive Branch is also the dominant voice of the United States in foreign affairs. Judicial power—the power to decide cases and controversies—is vested in the Supreme Court and inferior courts established by Congress. The judges must be appointed by the president with the advice and consent of the Senate, hold office during good behavior and receive compensations that may not be diminished during their continuance in office. If a court's judges do not have such attributes, the court may not exercise the judicial power of the United States. Courts exercising the judicial power are called "constitutional courts." Congress may establish "legislative courts," which do not take the form of judicial agencies or commissions, whose members do not have the same security of tenure or compensation as the constitutional court judges. Legislative courts may not exercise the judicial power of the United States. In Murray's Lessee v. Hoboken Land & Improvement Co. (1856), the Supreme Court held that a legislative court may not decide "a suit at the common law, or in equity, or admiralty," as such a suit is inherently judicial. Legislative courts may only adjudicate "public rights" questions (cases between the government and an individual and political determinations). Influences other branches of its agenda with the State of the Union address. The president exercises a check over Congress through his power to veto bills, but Congress may override any veto (excluding the so-called "pocket veto") by a two-thirds majority in each house. When the two houses of Congress cannot agree on a date for adjournment, the president may settle the dispute. Either house or both houses may be called into emergency session by the president. The Vice President serves as president of the Senate, but he may only vote to break a tie. The president, as noted above, appoints judges with the Senate's advice and consent. He also has the power to issue pardons and reprieves. Such pardons are not subject to confirmation by either the House of Representatives or the Senate, or even to acceptance by the recipient. The president is the civilian Commander in Chief of the Army and Navy of the United States. It is generally understood that he has the authority to command them to take appropriate military action in the event of a sudden crisis. However, only the Congress is explicitly granted the power to declare war per se, as well as to raise, fund and maintain the armed forces. Congress also has the duty and authority to prescribe the laws and regulations under which the armed forces operate, such as the Uniform Code of Military Justice, and requires that all Generals and Admirals appointed by the president be confirmed by a majority vote of the Senate before they can assume their office. Courts check both the executive branch and the legislative branch through judicial review. This concept is not written into the Constitution, but was envisioned by many of the Constitution's Framers (for example, The Federalist Papers mention it). The Supreme Court established a precedent for judicial review in Marbury v. Madison. There were protests by some at this decision, born chiefly of political expediency, but political realities in the particular case paradoxically restrained opposing views from asserting themselves. For this reason, precedent alone established the principle that a court may strike down a law it deems unconstitutional. A common misperception is that the Supreme Court is the only court that may determine constitutionality; the power is exercised even by the inferior courts. But only Supreme Court decisions are binding across the nation. Decisions of a Court of Appeals, for instance, are binding only in the circuit over which the court has jurisdiction. The power to review the constitutionality of laws may be limited by Congress, which has the power to set the jurisdiction of the courts. The only constitutional limit on Congress' power to set the jurisdiction of the judiciary relates to the Supreme Court; the Supreme Court may exercise only appellate jurisdiction except in cases involving states and cases affecting foreign ambassadors, ministers or consuls. The Chief Justice presides in the Senate during a president's impeachment trial. The rules of the Senate, however, generally do not grant much authority to the presiding officer. Thus, the Chief Justice's role in this regard is a limited one. The Constitution does not explicitly indicate the pre-eminence of any particular branch of government. However, James Madison wrote in Federalist 51, regarding the ability of each branch to defend itself from actions by the others, that "it is not possible to give to each department an equal power of self-defense. In republican government, the legislative authority necessarily predominates." One may claim that the judiciary has historically been the weakest of the three branches. In fact, its power to exercise judicial review—its sole meaningful check on the other two branches—is not explicitly granted by the U.S Constitution. The U.S. Supreme Court exercised its power to strike down congressional acts as unconstitutional only twice prior to the Civil War: in Marbury v. Madison (1803) and Dred Scott v. Sandford (1857). While the Supreme Court has since then made more extensive use of judicial review, it cannot be said to have as much political power as either Congress or the President. Throughout America's history dominance of one of the three branches has essentially been a see-saw struggle between congress and the president. Both have had periods of great power and weakness such as immediately after the Civil War when republicans had a majority in congress and were able to pass major legislation and shoot down most of the president's vetoes. They also passed acts to essentially make the president subordinate to congress, such as the Tenure of Office Act. Johnson's later impeachment also cost the presidency much political power. However the president has also exercised greater power largely during the 20th century. Both Roosevelts greatly expanded the powers of the president and wielded great power during their terms. Johnson and Nixon during the 1960s and 1970s exploited the presidency particularly Nixon. The first six presidents of the United States did not make extensive use of the veto power: James Monroe one, and John Adams, Thomas Jefferson and John Quincy Adams none. James Madison, a firm believer in a strong executive, vetoed seven bills. None of the first six Presidents, however, used the veto to direct national policy. It was Andrew Jackson, the seventh President, who was the first to use the veto as a political weapon. During his two terms in office, he vetoed twelve bills—more than all of his predecessors combined. Furthermore, he defied the Supreme Court in enforcing the policy of ethnically cleansing Native American tribes ("Indian Removal"); he stated (perhaps apocryphally), "John Marshall has made his decision. Now let him enforce it!" Some of Jackson's successors made no use of the veto power, while others used it intermittently. It was only after the Civil War that presidents began to use the power to truly counterbalance Congress. Andrew Johnson, a Democrat, vetoed several Reconstruction bills passed by the "Radical Republicans." Congress, however, managed to override fifteen of Johnson's twenty-nine vetoes. Furthermore, it attempted to curb the power of the presidency by passing the Tenure of Office Act. The Act required Senate approval for the dismissal of senior Cabinet officials. When Johnson deliberately violated the Act, which he felt was unconstitutional (Supreme Court decisions later vindicated such a position), the House of Representatives impeached him; he was acquitted in the Senate by one vote. Grover Cleveland worked to restore power to the Presidency after Andrew Johnson's impeachment. Johnson's impeachment was perceived to have done great damage to the presidency, which came to be almost subordinate to Congress. Some believed that the president would become a mere figurehead, with the Speaker of the House of Representatives becoming a de facto Prime Minister. 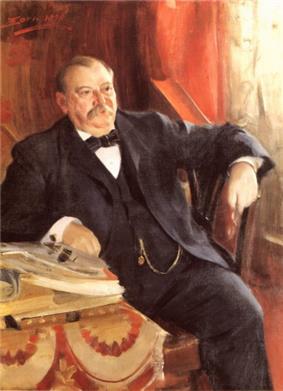 Grover Cleveland, the first Democratic President following Johnson, attempted to restore the power of his office. During his first term, he vetoed over four hundred bills—twice as many bills as his twenty-one predecessors combined. He also began to suspend bureaucrats who were appointed as a result of the patronage system, replacing them with more "deserving" individuals. The Senate, however, refused to confirm many new nominations, instead demanding that Cleveland turn over the confidential records relating to the suspensions. Cleveland steadfastly refused, asserting, "These suspensions are my executive acts ... I am not responsible to the Senate, and I am unwilling to submit my actions to them for judgment." Cleveland's popular support forced the Senate to back down and confirm the nominees. Furthermore, Congress finally repealed the controversial Tenure of Office Act that had been passed during the Johnson Administration. Overall, this meant that Cleveland's Administration marked the end of presidential subordination. Several twentieth-century presidents have attempted to greatly expand the power of the presidency. “Court Packing” plan, under which more seats would be added to the Supreme Court for the president to fill. Such a plan (which was defeated in Congress) would have seriously undermined the judiciary's independence and power. Richard Nixon—whose presidency is sometimes described as "Imperial" (see Imperial Presidency)—used national security as a basis for his expansion of power. He asserted, for example, that "the inherent power of the President to safeguard the security of the nation" authorized him to order a wiretap without a judge's warrant. Nixon also asserted that "executive privilege" shielded him from all legislative oversight; furthermore, he impounded federal funds (that is to say, he refused to spend money that Congress had appropriated for government programs). In the specific cases aforementioned, however, the Supreme Court ruled against Nixon. This was also because of an ongoing criminal investigation into the Watergate tapes, even though they acknowledged the general need for executive privilege. Since then, Nixon's successors have sometimes asserted that they may act in the interests of national security or that executive privilege shields them from Congressional oversight. Though such claims have in general been more limited than Nixon's, one may still conclude that the presidency's power has been greatly augmented since the eighteenth and nineteenth centuries. Many political scientists believe that separation of powers is a decisive factor in what they see as a limited degree of American exceptionalism. In particular, John W. Kingdon made this argument, claiming that separation of powers contributed to the development of a unique political structure in the United States. He attributes the unusually large number of interest groups active in the United States, in part, to the separation of powers; it gives groups more places to try to influence, and creates more potential group activity. He also cites its complexity as one of the reasons for lower citizen participation. 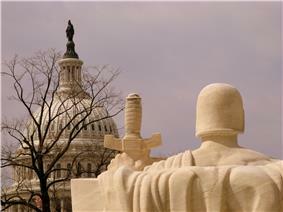 Separation of powers has again become a current issue of some controversy concerning debates about judicial independence and political efforts to increase the accountability of judges for the quality of their work, avoiding conflicts of interest, and charges that some judges allegedly disregard procedural rules, statutes, and higher court precedents. It is said on one side of this debate that separation of powers means that powers are shared among different branches; no one branch may act unilaterally on issues (other than perhaps minor questions), but must obtain some form of agreement across branches. That is, it is argued that "checks and balances" apply to the Judicial branch as well as to the other branches. It is said on the other side of this debate that separation of powers means that the Judiciary is independent and untouchable within the Judiciaries' sphere. In this view, separation of powers means that the Judiciary alone holds all powers relative to the Judicial function, and that the Legislative and Executive branches may not interfere in any aspect of the Judicial branch. An example of the first view is the regulation of attorneys and judges, and the establishment of rules for the conduct of the courts, by the Congress and in the states the legislatures. Although in practice these matters are delegated to the Supreme Court, the Congress holds these powers and delegates them to the Supreme Court only for convenience in light of the Supreme Court's expertise, but can withdraw that delegation at any time. An example of the second view at the State level is found in the view of the Florida Supreme Court, that only the Florida Supreme Court may license and regulate attorneys appearing before the courts of Florida, and only the Florida Supreme Court may set rules for procedures in the Florida courts. The State of New Hampshire also follows this system. Davis, Zoe (2001). "Presidential Vetoes, 1989–2000" (PDF). United States Senate. Dean, John W. (2004). "The U.S. Supreme Court and The Imperial Presidency". Find Law. Kilman, Johnny H. & Costello, George, eds. (2000). The Constitution of the United States of America: Analysis and Interpretation. Washington, DC: Government Printing Office. Kunhardt, Philip B., Jr.; Kunhardt, Philip B., III & Kunhardt, Peter W. (1999). The American President. New York: Penguin. Madison, James (1788). "The Particular Structure of the New Government and the Distribution of Power Among Its Different Parts". Calabresi, Steven G. (2008). "The Great Divorce: The Current Understanding of Separation of Powers and the Original Meaning of the Incompatibility Clause". University of Pennsylvania Law Review 157: 134–137. Prakash, Saikrishna Bangalore (2009). "Why the Incompatibility Clause Applies to the Office of President". Duke Journal of Constitutional Law & Public Policy 4: 143–151. Mount, Stephen J. J. (2003). "Rewriting the Constitution".